Home / DadGeek / pc / steam / videogames / xbox / Just keep digging , Just keep digging. A Graveyard keeper review. Just keep digging , Just keep digging. 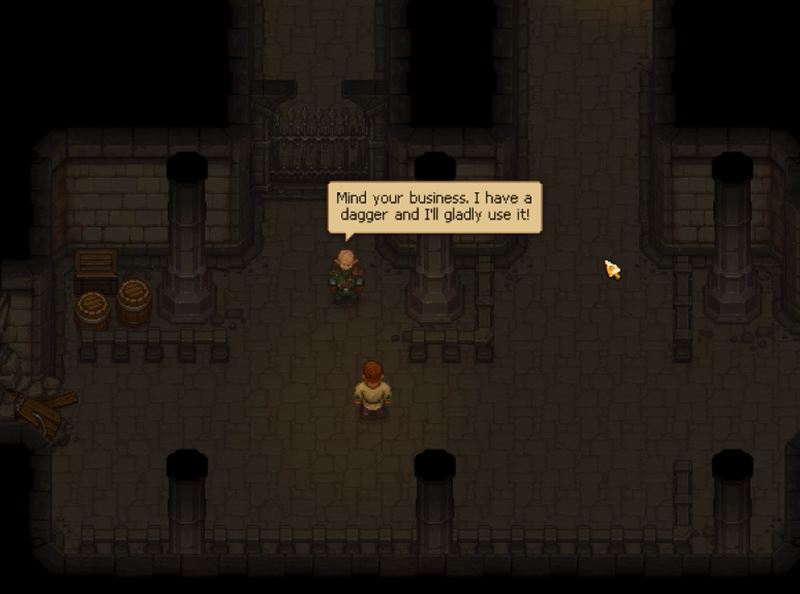 A Graveyard keeper review. Graveyard keeper; There has been a grave mistake. One moment you are texting your love on a cellphone, the next you are buying crops in unmarked graves in a medieval landscape under the instructions of a surly talking skull. Surely this is a dream, a mistake has been made, I don't belong here. Everyone here needs something , it is chore after chore. day after day... never ending. Not just onto graveyard but I also need to become a botanist, carpenter, blacksmith , cook and so much more to bring balance to this place and create a successful economy. But while I am here I might as well push on and build the best graveyard business ever until the day comes I can get back home. Graveyard keeper is a medieval management sim not unlike games such as "Stardew Valley" or "Harvest Moon" but with a dark twist. From the minds of Lazy Bear, creators of Punch Club in this game you end up in charge of the local graveyard and it is your job to bring it back from its decaying state and turn into in a high performance venue, using any means necessary. With the backing of the locals and the ruling clergy you will navigate and occasionally cross the moral boundaries in order to run a successful graveyard and to meet the many request from people you meet along the way. After a brief talk with a mysterious figure you are directed to go dig up Gerry, a skull with a bad memory, a thirst for alcohol and a snarky disposition. Gerry will give you some directions on what to do next and before you know it a donkey shows up with a corpse. It seems that besides talking to skulls you can also understand the donkey and you get told he feels underpaid doing his job or regular corpse delivery. You agree to take care of this delivery and one day make a a better offer to the donkey. From here things really get weird. You are directed to retrieve meat from the corpse and then bury it. What to do with this meat ? You have no time to find out because the graveyard is in terrible state and it would benefit form being cleaned up. A bishop that wonders in instructs you to get to it and once you have things in a better state he will open up the church and promote you. Maybe this is the way out of this place and back home. As you can tell the game throws a lot of information at you when you start and it can be a bit disorienting, strongly enough at the same time it also withholds a lot of information from you. You will feel lost and have to go explore and talk to people, explore your tech (skill) tree and try some out, and move one step at a time in order to move forward. Each step requires a series of additional steps, which require more resources that need another series of steps to acquire. But once you get you workstations setup things will get easier. Before you know it you are building bigger constructs, cooking better recipes ( yes with that meat) and perform better autopsies. 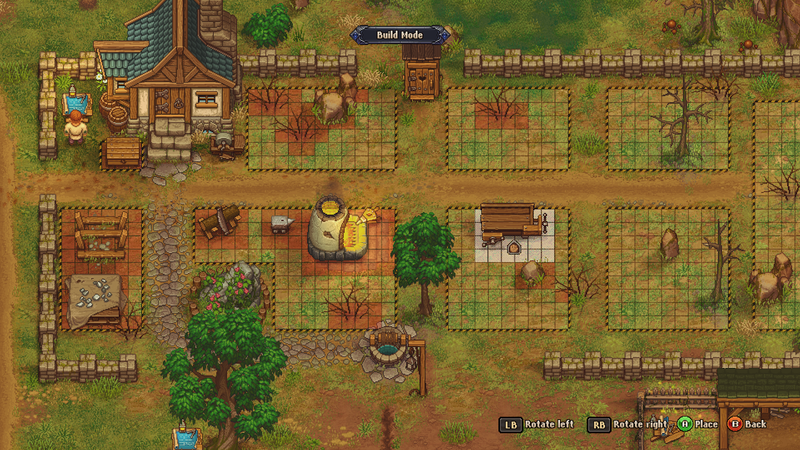 As indicated in the previous chapter, Graveyard Keeper is a resource management sim. and it even though its theme is quite silly, it has a very deep quest and craft system.There is even some light combat. You will learn quickly that everything you do cost resources. If you want a wooden board to built a fence, you need wood, from a tree which you chop with an axe, but the axe will wear down so you need a whetstone do fix it. Chopping itself cost energy of which is finite as well and you sleep or eat/drink to recover. Once you have a log of wood you need to use a sawmill to cut the boards and a workbench to create them into planks. It feels almost like I am the guy trying to fix a leaky bucket with the help from dear Liza. 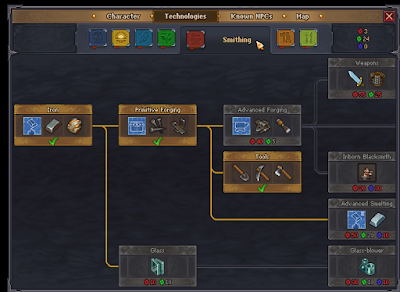 The skill/tech tree is almost intimidating, so you want to take moment checking it out. There are separate tabs for seven different categories. Each of those have a series of techs that you can unlock through playing the game. Often step one is a discovery of the technology such as building instructions or a recipe. Then you need to unlock the skill with experience points after which the skill is usable in the game. experience points come in three different variations. Each can be earned by performing other tasks. And so the circle of collections skills and resources in order to unlock more skills and resources continues. If this sounds confusing it is because it is. There is not too much handholding in the game and it will take a while before you feel you are actually make progress. Perhaps playing with a wiki when you start the game is a good idea if you want to get a solid start and not make too many mistakes in the beginning. This is not a friendly neighborhood. This feel of ever moving goalposts also pushes into the questing in the game. 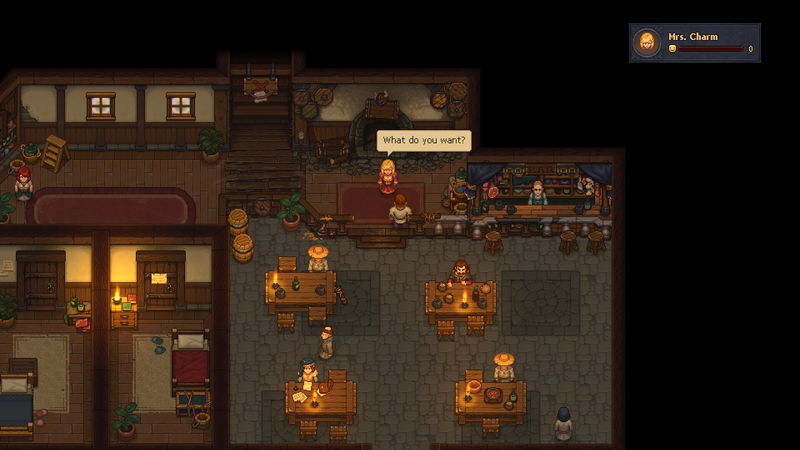 One of your first quests is to talk to a tavern owner and try to sell him meat. But in order for him to buy it he wants it to have a stamp. Seems easy enough to get one, but to get to the right person you need to go through a whole series of additional requirements. Some of the NPC might not like you much and you need to get friendly with them before they give you want you need. Other NPC's will only appear at certain times int he game. The game has a clock on the left portion of the HUD that shows progression of the day and the week . The week does not use days as we do but rather a series of symbols which are a bit confusing to get used to. You can also speak to the towns folk to trade for items. This can be a great way to come up with some of the needed resources early, but the economy is not an endless resource of wealth for you to abuse as the villagers have a limited budget to work with. But even so it is a useful steppingstone to get ahead in your endless quest to move forward. 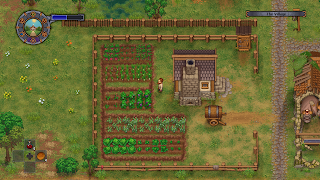 As you are trading, questing, building, cooking and gardening it feels like the grave yarding business is taking a backseat and you almost forget the title of the game and its main focus. That is until the chime of another delivery of the talking donkey reminds you. 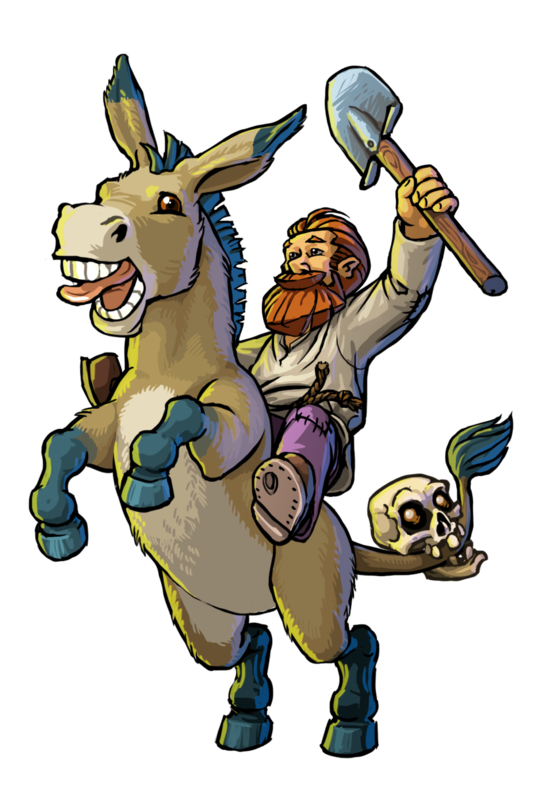 Off course once you improve your grave digging business enough the donkey wants in and demands carrots as payment, which mean another resource with its own series of steps to get. Are you seeing a pattern yet? 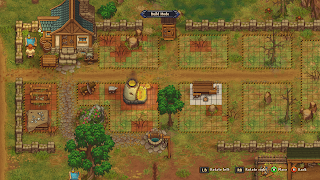 Graveyard keeper is a top down/isometric pixel art game with a unique look clearly conveys the medieval environment. The game has day and night cycles, weather effects and environmental changes. The UI calendar/clock that is used shows day/time progress is fine but the symbols for the the days feels like a unnecessary complication to add to a game that already has so much going on in it. The lack of tutorial and the amount of information thrown at you from the start will be very overwhelming for beginning players. Graveyard Keeper could benefit from a bit more of a tutorial and early on feeling of accomplishment. Instead it is more like being thrown in the deep end after being told that water is wet. The story of the game is not very deep and feels very secondary. Clearly it is not taking itself all that serious with the silly premise that this game brings. 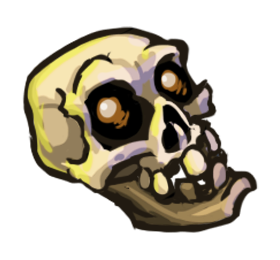 But on welcome note, the game brings us the smarmiest video game skull since Morte (Planescape:Torment) and Murray (Monkey Island). The music is simple but varied, but on long plays I can see many people just putting on their own soundtrack on the background. Each person taking has a unique sounding sound effect that seems to fit their character but often on long conversations they can become annoying and it is nice to skip ahead quickly. The skill/tech tree is imposing but once you take a moment to look at very clear in telling you what a skill does and what it needs. The map is feels less useful as it is not very detailed and you cannot tell where you are on the map so you will have to look for landmarks and find out where you are the old fashioned way. First of all I want to say to consider the theme of the game. From the get go it has you perform autopsy on a corpse and try to sell the meat, cook it and eat it. From there you will run into a series of morally questionable choices. There is also regular reference to alcohol. However it is all in jest and the addition of the pixel art makes this not a scary or gory game at all, it is more of the theme that can be an issue. The game does have a whole host of other things to do that often put the graveyard thing on a back burner. Harvesting crafting , questing all take a lot of time away from the main theme. The pace of the game is calm, and even if there is moving time line with a day and night cycle , there seems to be no deadline and you can take your time to do what you want to do. In a plethora of run and gun games leading the charge it is a welcome change of pace. Besides that the game is loaded with busy work but it is important to be able to read in order to understand how the the different parts link together. The difficulty of the game can be a challenge as well but nothing that cannot be learned or solved with a wiki. However if the theme is not your cup of tea you might be better of checking out other games in the sim management field. 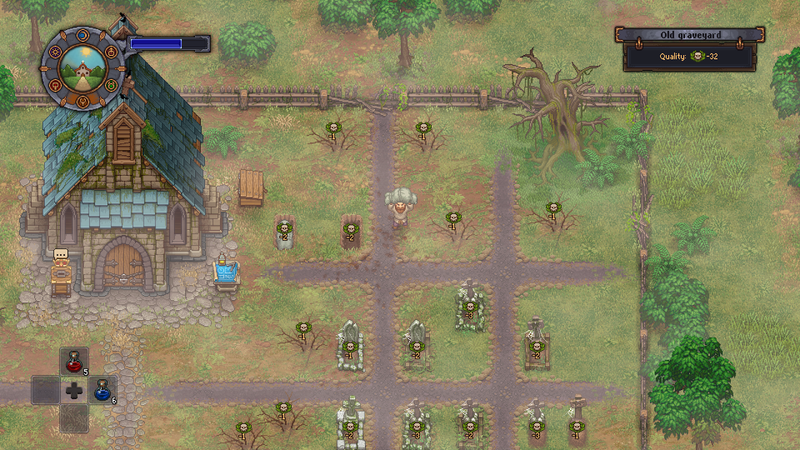 Graveyard Keeper, like many resource management games, is not a game to play when trying to finish it any time soon, It is recommended to take your time and move through the game taking small steps at a time in order to unlock the next portion of the game. It can be one of those games to play while you have things go on in the background. The biggest issues with the game are mostly balanced based. The constant shifting of the goal posts can become cumbersome and make it hard to continue. A game needs to get you in a feedback loop that keeps dripping feelings of accomplishment so you get that endorphin rush that make you forget the difficulty you just had with it and want to play further. 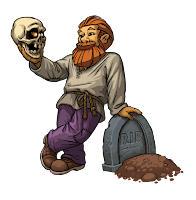 Most of the time the tasks in Graveyard Keeper do not give you a payoff but rather just send you further down the rabbit hole. Luckily the time progression does not add pressure to you to complete things besides being somewhere on the right day to meet certain NPC's. Lazy Bear already released patches introducing gameplay fixes and changes that will help balance out the game better, such as longer in game day cycles.